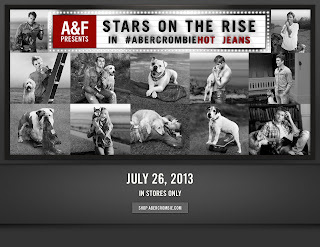 Apparel and lifestyle brand, Abercrombie and Fitch celebrated the launch of their 2013 Stars on the Rise campaign at The Grove this past Thursday. Celebs such as Jennifer Lawrence, Taylor Swift, Channing Tatum, and Ashton Kutcher were once among the elite group. Now, Ashley Hinshaw (Chronicle), Scott Eastwood (Texas Chainsaw 3D), Alexander Ludwig (Vikings), Emayatzy Corinealdi (Middle of Nowhere), Alex Kaluzhsky (The Taking of Pelham 123), Halston Sage (Grown Ups 2), James Frecheville (Adore), Taylor Handley (Chasing Mavericks), Jacob Artist (Glee), Johnny Ferro (Children of God), and Lily Rabe (American Horror Story) are the new Stars on the Rise - a group of up and coming actors and actresses who have been selected to be the faces of the brand’s back to school ad campaign, which was shot by famed photographer Bruce Weber. Also in attendance was Uggie (The Artist) and his talented brothers Popeye (skateboarding American Bulldog) and Julio (skateboarding English Bulldog), who also happen to be part of the campaign. I had the pleasure of speaking to the dogs’ owner/trainer Omar von Muller and also got to spend some quality time with the loveable Uggie, which was a big bonus for me! Inside the store guests had the opportunity to preview the new collection, which was worn by the store’s sales associates (who looked like models themselves), while sipping on specialty cocktails and nibbling on tasty appetizers. 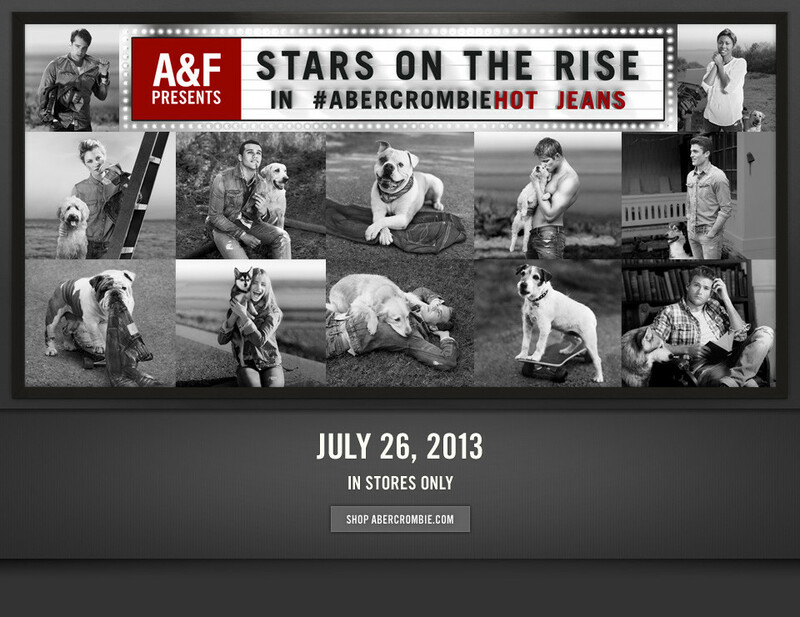 In conjunction with the Back-to-School launch Abercrombie and Fitch is releasing a new smartphone app (available in the Apple App store). One of the app’s features is “6 Degrees of Stars on the Rise,” which is an interactive experience that lets users create a story connecting them with their favorite Star on the Rise by pulling in their Facebook data and creating an entertaining, shareable story. Customers will also have the opportunity to participate in the “Everyone Instantly Wins” sweepstakes, which will launch on July 26th. Anyone who visits participating Abercrombie and Fitch stores from July 26th – September 1st can enter the sweepstakes for a chance to win a pair of Jeans or a promotional gift card.